Anti-KLH, anti-SRBC, anti-tetanus toxoid, anti-DNP and anti-TNP IgM and IgG are used as biomarkers of immunotoxicity. Life Diagnostics manufactures ELISA kits for these biomarkers in mice, rats, chickens, and monkeys. In preclinical studies, animals are immunized with an antigen such as KLH while being dosed with a drug candidate. The levels of anti-KLH IgM and IgG are determined in serum collected at 7 or ~21 days and compared with those in a control group that was not exposed to the drug. 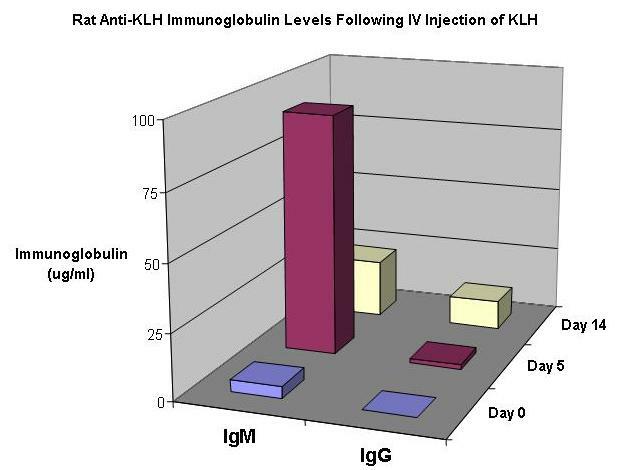 A decrease in anti-KLH levels in the treatment group provides evidence of immunosuppression. Orders may be placed by phone, fax, email, or via our online shop. For technical advice please email us at techsupport@lifediagnostics.com. All kits listed below are manufactured by Life Diagnostics, Inc. All kits are manufactured by Life Diagnostics, Inc.
*Kits KLHM-3-INT and KLHG-3-INT use standard material of non monkey origin, allowing for exportation without CITES documentation. Our rat and monkey anti-KLH IgG ELISA kits have recently been evaluated and gained unqualified approval in a respected independent laboratory (Validation of an ELISA assay for quantification of anti-KLH IgG in rat and monkey sera. CIT, Evreux, France. Armelle N. Guyen, Sandrine Arthaud, Phillipe Ancian and Roy Forster. Toxicology Letters, Volume 180, Supplement 1, 5 October 2008, Page S211).